This book is not necessarily an apology for church history so much as an apology for history in general. 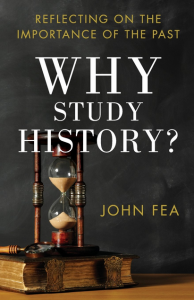 Fea teaches history at a Christian college (Messiah College) and regularly tries to instill into his freshman the general importance of taking their required history classes seriously and the benefit that history can be to anyone. This book is a product of his years of making this argument to students. Fea spends time simply explaining what students of history do and why. He also discusses how history inspires us, helps us escape the present, gives a sense of self, contains people like us, and helps to give a better present and future. The author also spends time talking about how the past can be difficult to bring to life, how Christians can use the past, and many of the things you can do with a history major. I found it interesting that the list of history majors is long and diverse, including the likes of George W. Bush (president), Antonin Scalia (supreme court justice), Katharine Hepburn (actor), Newt Gingrich (Speaker of the House), Joe Biden (vice-President), Grant Hill (NBA player), and W. E. B. DuBois (founder of NAACP). As a book intended to proselytize someone skeptical of history, it is highly successful and fun to read. It is a nice introduction to some of the heavier books like Carl Trueman’s Creedal Imperative, Robert Rea’s Why Church History Matters, Michael Haykin’s Rediscovering the Church Fathers, or Paul Hartog’s The Contemporary Church and the Early Church.